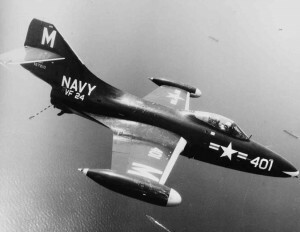 On March 28, 1952, a flight of three navy F9F-5 Panther jets took off from Quonset Point Naval Air Station for a training flight. At some point after take off, one pilot noticed that one of the other aircraft was on fire and radioed a warning. The burning aircraft (#12528) was piloted by Commander Richard L. Wright, the commanding officer of Fighter Squadron 73, (VF-73). Being over a populated area, Commander Wright made no effort to bail out, and elected to stay with the aircraft. His plane crashed and exploded in a wooded area off Tiogue Avenue in the town of Coventry, near the East Greenwich town line. Commander Wright was a veteran of WWII, and had earned the Distinguished Flying Cross, four Air Medals, and various other medals during his time in the service. He was survived by his wife Susan, and a son, Richard Jr.. He’s buried in Arlington National Cemetery. There has been some discrepancy over the years as to the location of this accident. Some sources say it occurred in the water off Little Compton, Rhode Island, or in the town itself. Others state Coventry-East Greenwich. A check with the Coventry Town Hall has revealed that the crash actually occurred in Coventry, Rhode Island. Newport Daily News, “Navy Pilot Identified”, March 29, 1952, Page 3.